As Canada’s capital city and its governmental hub, Ottawa is a must-visit destination for history, culture and architecture. But did you know that it’s also a nature lover’s paradise? Hidden behind the chateaus, skyscrapers and parliamentary towers that fill Ottawa’s horizon, you’ll find 170 kilometres of pathways just waiting to be explored. Many of these trail sections lead directly to Ottawa’s best museums and attractions, meaning you already have a path towards discovering this vibrant city. Inspired by Ottawa Tourism. Start your journey at the heart of Ottawa’s section of The Great Trail – Major Hill’s Park. Located just behind the imposing Fairmont Château Laurier, the park features winding pathways that are accessible all-year round. Avid flower-aficionados will be in for a treat in May, when the park’s flower beds are filled with bold, blooming tulips. 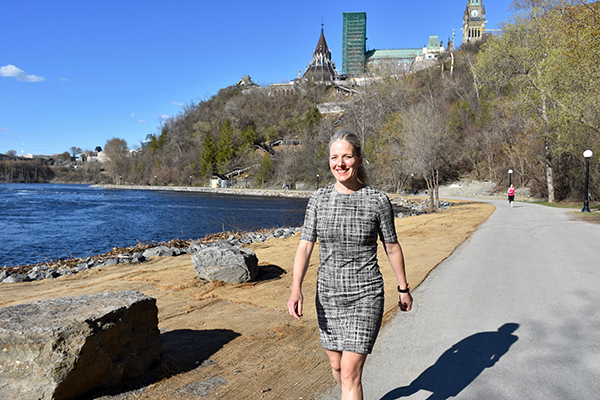 Meanwhile, trail users with an eye for the perfect Instagram snap will love the views of Parliament Hill, the Rideau Canal, the Canadian Museum of History and Gatineau Hills. Indeed, this panorama seems to pave the way towards Ottawa’s best attractions and heritage monuments. Since you’re already on the Capital Pathway, explore Ottawa’s riverside walk and gaze out at the iconic balanced rock sculptures along the Remic Rapids. These intricate artworks were constructed by artist John Felicè Ceprano, who continues to create new installations all summer long. Now that you’ve explored some of Ottawa’s Trail on foot, why not see it by boat? 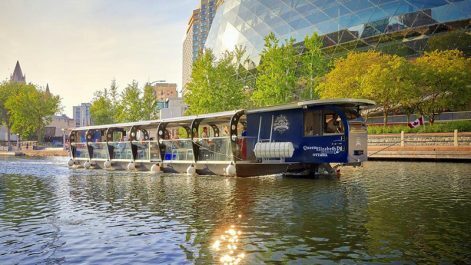 Jump on board the Rideau Canal Cruise and sail through downtown Ottawa and explore this historic waterway. The Rideau Canal is a UNESCO World Heritage Site and North America’s oldest continuously operating canal. Feeling hungry? Get a taste of Canada’s versatile and multicultural cuisine at SOCIAL Restaurant & Lounge. Taking inspiration from local producers, this innovative bar serves up delicious and hearty meals (save room for their signature Popcorn Sweetbreads). After lunch, discover the numerous cultural activities that surround Ottawa’s trail network. The stunning Canadian Museum of Nature is a must-see, with a massive 19-metre skeleton of a blue whale in the mind-blowing Water Gallery. 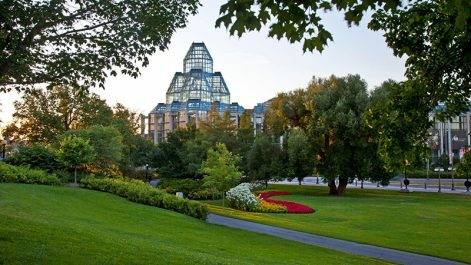 Art aficionados will be impressed by the collections in the National Gallery of Canada, as well as its award-winning architecture. 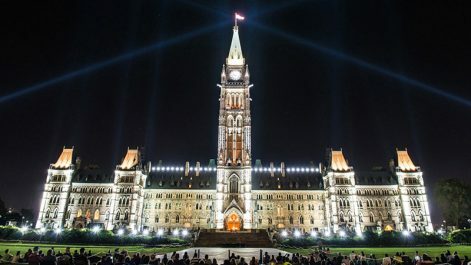 After a luxurious supper at the Sussex Drive, Parisian-inspired Métropolitain Brasserie, take a moonlit stroll past Fairmont Chateau Laurier and Parliament Hill before sampling Ottawa’s nightlife. Now that you’ve explored The Great Trail on land and water, why not take to the skies and see it from above? Soar above the Trail with Ottawa Biplane Adventures, departing from the Canada Aviation and Space Museum. 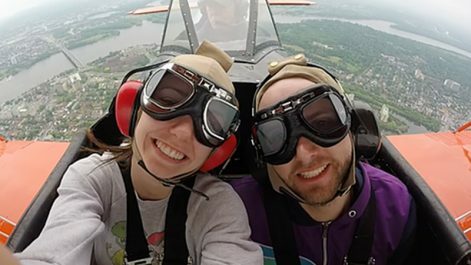 As you fly above Canada’s capital region in a Waco UPF-7 biplane, you’ll spot the winding path of the Ottawa River, Gatineau Park and several Ottawa landmarks. Perhaps you prefer terrestrial travel? Ottawa has plenty of opportunity for cycling enthusiasts too. Enjoy a three-hour guided bike tour with Escape Bicycle Tours and Rentals, and ride the highlights of Ottawa’s Trail. On Sunday, grab some breakfast at your hotel and walk to Parliament Hill, the home of Canada’s federal government. Take a free guided tour to get a glimpse of the inner workings of Canadian democracy and witness the ceremonial Changing of the Guard. Visit the ByWard Market. A short walk across the Rideau Canal, the market offers the best in locally-grown fruit, vegetables and other produce. The market is also home to numerous craft shops, boutiques, cafes, bistros and nightclubs. After all that exploring, you’ve probably worked up an appetite. Experience old-world Italian dishes in an upscale setting at The Grand pizzeria. If you have time at the end of your stay in Ottawa, return to where you started – Major Hill’s Park. There, you’ll find Tavern on the Hill, a seasonal pub with stunning views of the Trail. When it comes to luxury accommodation in Ottawa, it doesn’t get more iconic than the Fairmont Chateau Laurier. A landmark for locals and visitors alike, this replica of a French chateau has hosted the great and the good in the Canadian capital since opening in 1912. Lavish rooms, high ceilings ad glittering chandeliers await you in this wondrous five-star hotel.